Ever hear of a sundog? While some people may think of a golden retriever or dachshund sitting in a lawn chair and basking in the sun, a real sun dog has nothing to do with dogs. But they sure do have a lot to do with the sun! By the way, sun dogs, are often referred to by their Latin name: parhelion (or parhelia, when referring to more than one parhelion). A sundog is a colorful, bright light seen in the sky. While some are as bright and colorful as rainbows, a sun dog is not a type of rainbow. 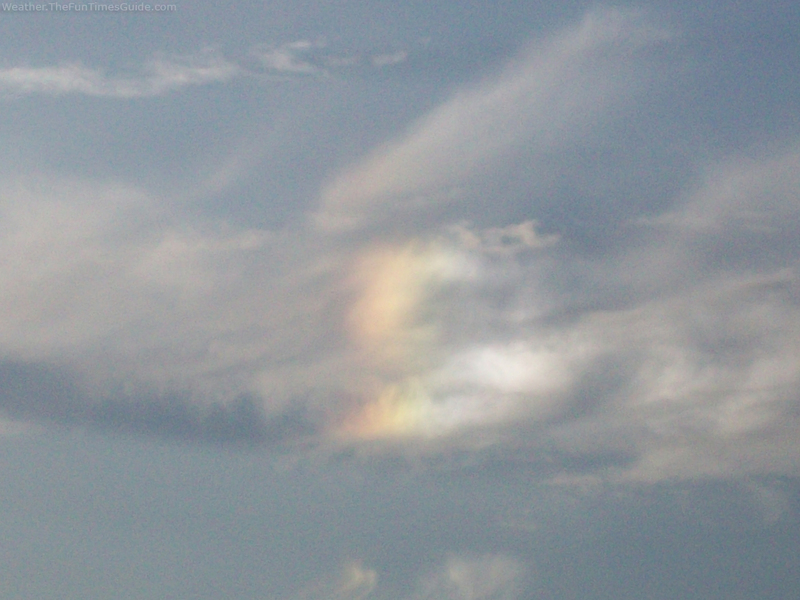 Similar to rainbows, however, sun dogs also represent a prism effect. A rainbow is typically seen when raindrops create a prism effect with the sun’s light. 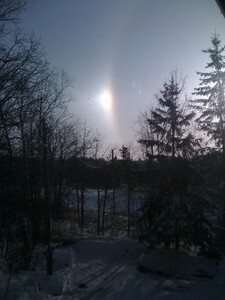 Sun dogs are made visible thanks to ice crystals. Sundogs are known as a kind of ice halo. Sun dogs are found at (or more than) 22 degrees to the left or right of the sun and at the same height above the horizon as the sun. How does a sun dog form? It all comes down to a little geometry — and refraction. As you may know, refraction is simply the act of bending light. Hexagonal (6-sided) ice crystals are the key ingredient to the recipe for making a sun dog. Quite simply, hexagonal ice crystals can act as prisms. To be precise, they can act as 60-degree (or equilateral) prisms. Remember, equilateral triangles have 3 angles — each at 60 degrees. The angle of refraction for the sunlight going though one of these ice crystal prisms is 22 degrees. Thus, a sun dog is seen at or at least 22 degrees away from the sun. Here are the nitty-gritty details of the science behind sun dogs. Sundogs are not a rare or uncommon phenomena. Sun dogs are well known to form virtually anywhere in the world. They are sometimes seen twice a week or more! the band Rush mentions sun dogs in their 1989 song Chain Lightning. More about these and other historical, social, and pop-culture references to sun dogs. Because of the scientific elements necessary for a sundog to be viewed, a sun dog is much easier to see around the times the sun is closer to the horizon (either rising or setting), rather than when the sun is higher in the sky (like around noon). Be careful! Looking at a sun dog means having to look in or near the direction of the sun. So be sure to block the sun with something — such as your hand, a book, a sign, or even a building. Looking directly at the sun can severely (even permanently!) injure your eyes. Remember that sundogs must be seen at or beyond 22 degrees from the sun, and at the same height as the sun. Also, because sun dogs are a type of ice halo, there need to be ice crystals in the sky. However, this doesn’t mean you have to see snow falling around you in order to see a sun dog. In fact, ice crystals are commonly found high in the atmosphere. Sun dogs can sometimes be found in cirrus clouds (the wispy clouds high in the sky). While sun dogs can be found all throughout the year and in various locations, your chances of seeing a sun dog are better if you live in a colder part of the world.